alaTest a collecté et analysé 256 avis de consommateurs et d'experts pour le produit Cuisinart SS-700 Single Serve Keurig Brewing System. La note moyenne du produit est 4.1 sur 5, tandis que les autres produits de même catégorie ont une note moyenne de 4.2 sur 5. Les testeurs apprécient la taille. Après analyse des notes de consommateurs et d'experts, de l'âge du produit ainsi que d'autres facteurs, et comparé aux autres produits de même catégorie, le Cuisinart SS-700 Single Serve Keurig Brewing System obtient un alaScore™ de 84/100 = Très Bien. I WILL NEVER BUY THIS PRODUCT AGAIN. CUSTOMER SERVICE EXCELLENT. COFFEE MAKER (2) DID NOT WORK. WHO IS DOING THE REFURBISHING? I use this product three or four times a day, and it always makes a perfect cup of coffee. I used the product at home for the first couple weeks, and my skeptical husband loved it! When I took it to work on week 3, he was sad! I love the blue light where the water reservoir is. 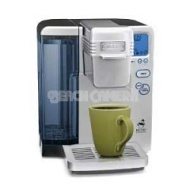 It is similar to the Keurig but I preferred this design better and it has the rinse button that the other doesn't. So good.... I bought 2 more! Love the oversize water reservoir and multiple cup sizes. I have one for personal use and this one we purchased for work. Everyone was surprised and thrilled with the overall size and usefulness.Highly recommend this brand!